Artwork of Pikmin drinking nectar in Pikmin. Nectar is used to turn Pikmin from leaf or bud stages directly into the flower stage. A single drop of this yellow liquid can be shared by several Pikmin. Swarming Sheargrubs can also drink nectar, and will grow bigger if they do. A screenshot of a drop of nectar in Pikmin 2. When on the ground, any leaf or bud Pikmin that pass by it will crouch down and begin to slurp it for roughly two seconds, regardless of being idled or directed to it. In the first two Pikmin games, any number of Pikmin may drink a blob at once, but a single Pikmin can drink the entire content by itself too. In other words, as long as a drop is being slurped, other Pikmin may join in, up to a certain time limit. This time limit is quite strict in Pikmin, but lasts longer in Pikmin 2. 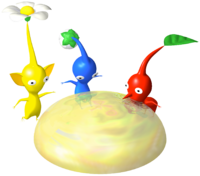 In Pikmin 3, a single Pikmin will not exhaust the entire supply at once, instead drinking only one tenth of the total and leaving the rest. This means that a drop of nectar can be used multiple times, but is only enough for ten usages in total. There are numerous places where nectar can be found. In most of these cases, more than a single drop of nectar may be obtained at once. "This golden liquid causes immature Pikmin to instantly blossom. Pikmin move much faster once they've matured, so try to make use of any nectar you find." Nectar spread all over the ground in Pikmin Adventure. Nectar makes an appearance in Nintendo Land's attraction Pikmin Adventure. Nectar is a common item that can be found inside "?" blocks, and appears as leftovers from destroyed enemies. Every three blobs, a player will level up. It takes level 5 to get a bud, and level 10 to get a flower. Players will also drop a few drops of nectar when hurt. If the player isn't doing very well on a specific stage, the game will eventually spawn a rainbow "!" block near the starting point. Once this block is broken, a large drop of nectar appears that, when collected, instantly evolves all players to level 50. "Nectar is a condensed, highly nutritional food source that has been scientifically proven to encourage a Pikmin's growth. Also, it looks delicious." A Purple Pikmin at full bloom after drinking nectar. Nectar on the ground in Pikmin 3. A Nectarous Dandelfly from Pikmin 3. The data file explaining nectar. A screenshot of an early version of Pikmin showing a blue drop of nectar. There is a pre-made WarioWare: D.I.Y. microgame called Pikmin. In the game, the throwing cursor moves back and forth. When the player taps the screen, Olimar will throw a Red Pikmin to the cursor. It must land on the rock where nectar is in order to win the game. If the player misses, the Pikmin will land in the pond and drown. In Pikmin 3, if a leaf Pikmin drinks nectar, it back flips in happiness, but if a bud Pikmin drinks nectar, it will stretch its arms out and shake them. In Pikmin 2, if the first Pikmin that drinks nectar is a Bulbmin, the cutscene will trigger but the sound of a normal Pikmin will play. Since Bulbmin have a different voice, this is likely a mistake. This page was last edited on October 31, 2018, at 10:55.